Tuesday March 12th 1895 It was cold and windy today. I was busy with the work most of the forenoon and in the afternoon worked on my black dress waist that I am changing a little. I read most of the evening. Will had a letter from Joe Duncan today and Oliver went down to the office tonight with a reply to it. Wednesday March 13th 1895 It was a cold raw day. I was busy with sewing what time I had from the work. I made a pair of pillow cases. Will went to town after dinner. Thursday March 14th 1895 Will went down town this morning and sold Polly and we took her in soon after dinner. I spent the afternoon at Esthers as Mother was there spending the day. I had a pleasant afternoon. I put the lace on my pillow cases. 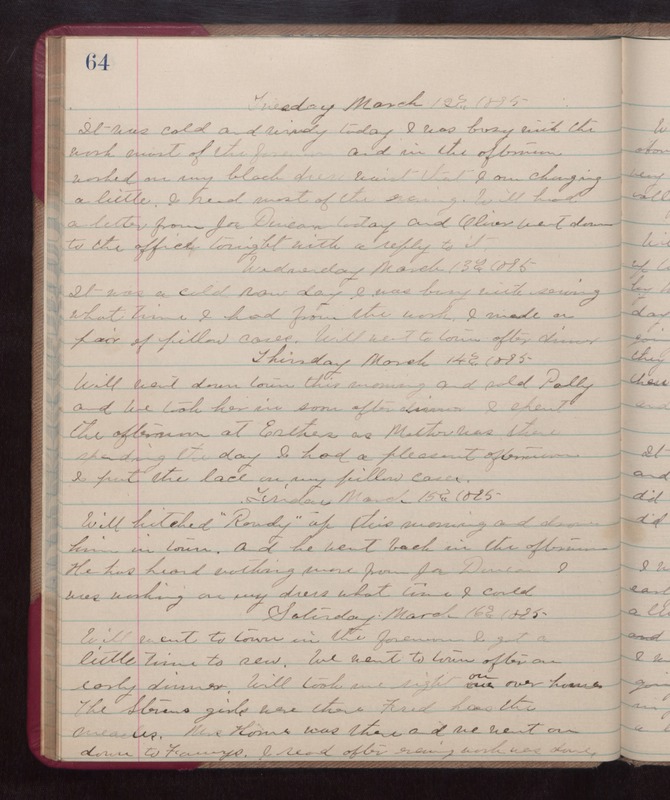 Friday March 15th 1895 Will hitched "Randy" up this morning and drove him in town and he went back in the afternoon. He has head nothing more from Joe Duncan. I was working on my dress what time I could. Saturday March 16th 1895 Will went to town in the forenoon. I got a little time to sew. We went to town after an early dinner. Will took me right on over home. The Stevens girls were there. Fred has the measles. Mrs Horne was there and we went on down to Fannys. I read after evening work was done.